Ground Morning Glory leaves vary a great deal in shape. Flowering occurs during December and January and are approximately 2.5 cm (1 inch) in diameter. No fruit. 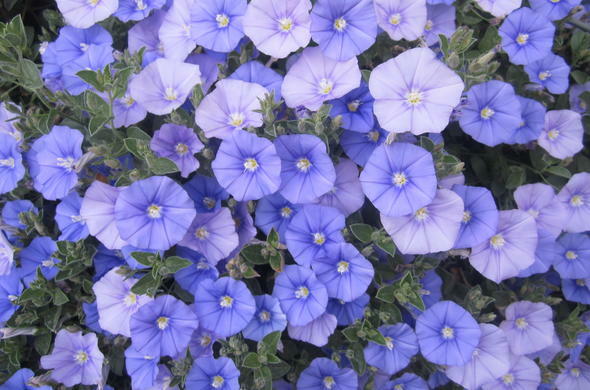 The Flowers are blue or purple in colour, trumpet shaped and bloom during the morning time. Evergreen foliage. It is fast growing, fairly hardy and usually grown as a perennial. Grows in the Northern Province and the Kruger National Park. The Ground Morning Glory also goes by the name Sweet Potato genus and because it is a climbing plant, it is often seen on gates and fences. The leaf is said to be used as a purgative, to treat indigestion and as a snake-bite remedy.